That’s the sound of the Free Library Book Bike rolling into a community event near you! Warm weather is on its way and we can’t wait to ride out of our local libraries and hit the streets of Philadelphia armed with library cards, books, prizes, and other fun stuff! 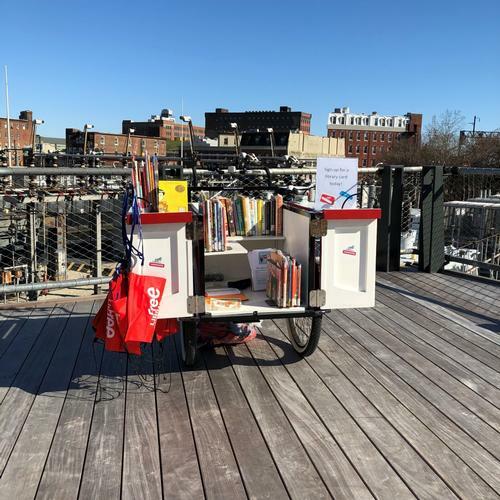 Today is National Bookmobile Day – part of the American Library Association's 2019 National Library Week festivities – and we thought it was the perfect opportunity to spotlight the Book Bike as we’re gearing up for another exciting season of spring and summer activities. This year, we’ve already had one highly successful event: a Lunar New Year celebration at the Rail Park. There were dragons, lions, drums, streamers, and tons of excited patrons of all ages signing up for library cards and checking out books directly from the Book Bike! It was a wonderful time and we can’t wait to do more community events at the Rail Park this summer. Stay tuned for more info! The Free Library currently has three Book Bikes providing services to Center City, South Philly, and West Philly communities at events like storytimes, Parks on Tap, and more, where we talk to the public about the Free Library’s programs and services, sign new patrons up for their very own library cards, and check out books, too! We here at Book Bike Headquarters are currently looking to fill up our 2019 schedule with all kinds of community events, so if your nonprofit or family-friendly function would like to enlist the service of the Free Library, please e-mail us at BookBike@freelibrary.org! Look out for the Free Library Book Bike at your community event this spring and summer! Add a Comment to #NationalLibraryWeek: It’s Bookmobile Day!